Gorgeous newly painted and decorated condo . This is an end unit with spectacular views! Condominium rental unit #324 accommodates up to 6 people with a king size bed in master bedroom, two twins in guest bedroom and queen sofa sleeper in living room. Unit has tile floors throughout with carpet in bedrooms. The dining table will accommodate 6 people and another 4 bars stools at the kitchen bar. 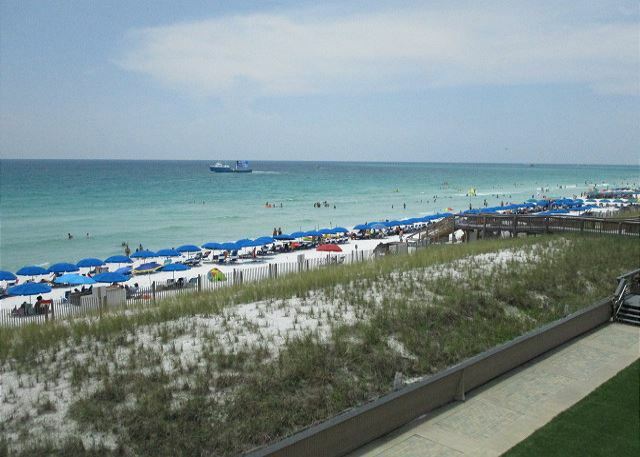 Enjoy the beauty of Destin`s beach from your private balcony as you watch the sun set over the Gulf of Mexico. The pool, sport courts and complimentary beach chairs are just steps away. Make your reservations today! Take advantage of complimentary Xplorie excursions to enhance your vacation. We LOVE to stay here at Holiday Surf and Raquet Club! We are returning guests because the rental is always pleasant, the location is GREAT and we never have any issues! Kristi E from Conroe, TX does not recommend this vacation rental. When we vacation in Destin, we stay at Holiday surf & Racquet Club. This time we needed a 2/2 and rented 324. it was a nice unit and will rent it again in the future. It was wonderful as always. We have been staying at Holiday Surf for many years and we realize that repairs and upkeep are done during the winter months. The staff is great and we are looking forward to retuning this November for an even longer stay.